Town in Old Castile, fifteen miles from Madrid. In the Middle Ages it was one of the wealthiest and most flourishing cities of Spain. Jews have resided there since 1085, when they dwelt in the street called "Calle de Lomo" (now "Calle de Esteban Domingo"). In 1291 the congregation was of such large proportions that it paid more than 74,000 maravedis in taxes. It possessed several synagogues. One of them was on the same spot in the Calle de Lomo on which the Church of All Saints was afterward built; a second, not far from the former, was "presented" by the government in 1495 to the monastery of Santa Maria de la Encarnacion. The Jewish cemetery, which had a frontage of about 200 meters, lay in the valley; it is now called "Cerca de los Osos." After the expulsion of the Jews their Catholic majesties "presented" it to the monastery of St. Thomas, which purchased additional land with the proviso that converts to Christianity or descendants of converts should not be interred therein. It was before the inquisitional tribunal of Avila in 1491 that the celebrated trial took place for the alleged ritual murder of the afterward canonized "child from La Guardia," a place that never existed. A shoemaker named Jucé Franco, his old father, and his brothers were accused of this murder, and were all put to death at the stake Nov. 16, 1491. As a sequel to the trial and execution a popular uprising took place, and the Jews in Avila were massacred and plundered. To such excesses did the popular fury give rise that a special edict had to be issued by the crown (Dec. 16, 1491) taking the Jews under royal protection. 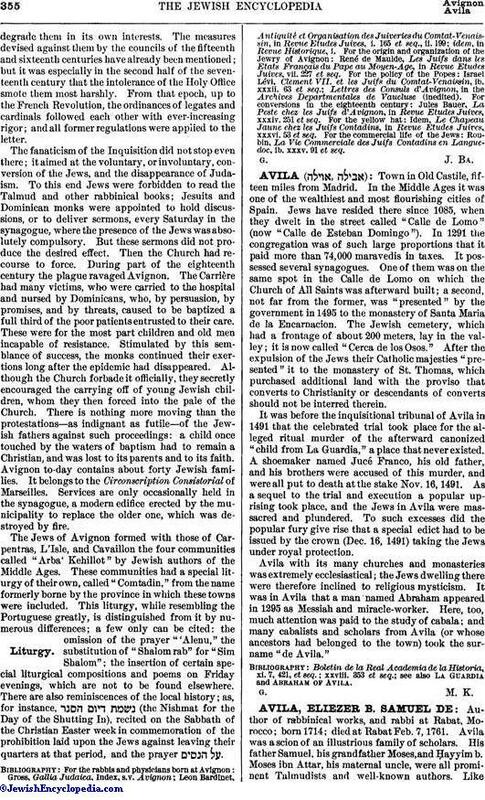 Avila with its many churches and monasteries was extremely ecclesiastical; the Jews dwelling there were therefore inclined to religious mysticism. It was in Avila that a man named Abraham appeared in 1295 as Messiah and miracle-worker. Here, too, much attention was paid to the study of cabala; and many cabalists and scholars from Avila (or whose ancestors had belonged to the town) took the surname "de Avila." see also La Guardia and Abraham of Avila.